Okay this book was not all that I expected. I think Angel could be a little more romantic sometimes, but he decided to play a game with Taryn and win her over the brains. The guy couldn't even bother to call her, so for me that was a very bad move. Taryn liked him, because he was alpha male and a different type from all the other she could boss around. So a nice surprise. Taryn liked him, for different reasons but we can see that she's just like every other woman and wants to hear pretty words from her man. So those three she works with decided to play save and be on her side during her break up. I liked seeing all those other faces and getting to know better those other guys that are definitely getting their happy ending pretty soon. Not so sure about the main couple, but they kinda fit together. Not sure this book was great like the rest of the series, but more like a regular romance. 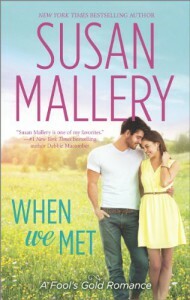 I expect more from Susan Mallery.